Farmers are the primary people who manage soil and plants on this planet, and we are in the best position to return that soil carbon. There are three reasons why we might want to do this. First, it is our best hope to survive on a habitable planet. Second, governments are going to get involved in requiring soil practice changes, and they are likely to do so by setting up incentive programs that can benefit farmers who adopt these changes. Third, carbon in soil means bigger, stronger, healthier crops. The biggest change we must make involves not exposing bare soil to the air. Every time that happens, soil carbon is oxidized and becomes carbon dioxide. Tillage is a primary offender in exposing soil. 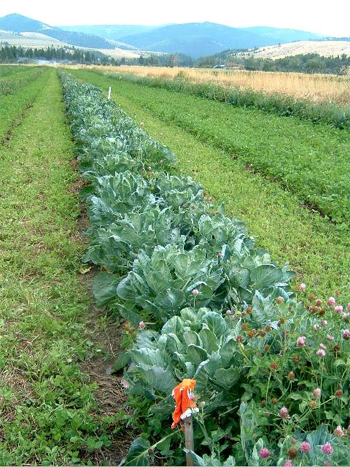 Organic farmers, particularly, use tillage to control weeds and prepare beds for planting. We need to find better ways of doing these, and to harvest so that soil continues to be covered after a crop is taken off. Another way to destroy soil carbon is by farming with synthetic toxins, chemicals and fertilizers which either kill or shut down the underground organisms that feed plants and store carbon. Organic farmers have wisely rejected such chemicals, and have found natural materials and processes that encourage, rather than undermine, this soil ecology. Farming in ways which will build more soil carbon won’t be easy. But farmers have always been tinkerers and innovators. Some are already experimenting with methods to keep soil covered with green plants: using cover crops, extending the season, raising more perennials. Others are trying to manage weeds by solarizing them, shading them out, or using cover crops and mulches. Some use nutrients from rock powders, brown and green manures, fermented fungal products, and inoculants that enable biological solubilization and fixation. This issue of The Natural Farmer explores early steps in this direction. We interview farmers experimenting with these practices, read some science on the problem, view a presentation by a pasture expert on sequestering carbon, learn about a few practical testing protocols to measure carbon’s impact in soil, and see what is being tried at one of the region’s premier agricultural companies. From what we are learning, raising organic annual vegetable crops is one of the more challenging kinds of carbon-friendly agriculture. A lot more needs to be learned, and we hope this issue prompts you to get interested and try out a few things that make sense in your operation. The more of us who are involved and gaining experience, the clearer our path will be!